The Charts of Clarence Larkin A mechanical engineer by training, Clarence Larkin later found his true calling as a pastor and an author of influential books on religion. He is best remembered, however, for his detailed charts on topics such as: The Underworld, The Failure of Man, The Threefold Nature of Man, and an incredibly detailed The Book of Revelations from his book on Revelations. These are awesome. I had no idea. I like how the first coming comes between Thursday and Friday, in this chart of the 7000 years of human history. I would have thought it would come on hump-day, but what do I know. 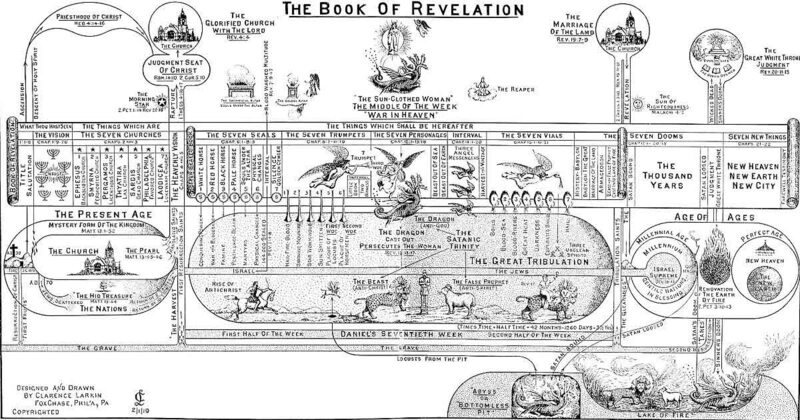 The one on the book of Revelations is probably the best. Pretty nifty. I love drawings like this. Revelation. Singular. It's one big revelation, not a whole bunch of little ones. Not being picky, the difference is significant. Well OK, I am being picky. Beat me too it Beagle. Wow. It's somewhere between outsider folk art and scientific diagram. Very cool.